I needed a quick lunch yesterday and started to dig through my pantry. I came up with a large can of diced tomatoes, a can of chicken and a can of green chili… thus my spicy chicken tomato soup was invented. 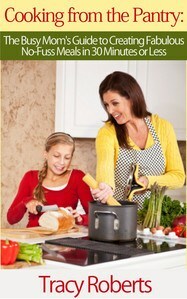 I love these simple, throw-together recipes and this one will quickly become a family staple. Serve it with a slice of homemade bread or some cheese quesadillas for a filling lunch or a simple dinner. Put the tomatoes, chicken and chilis with juice and everything into a medium sized pot. Bring to a boil and simmer for about 15 minutes. Season with salt, pepper and if desired a little chicken bullion powder. 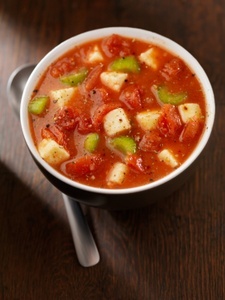 If you’re not a big fan of spicy things, add a few diced bell peppers or some chopped celery to the soup. Turn it into a vegetarian version by using tofu instead of chicken. This recipe will work well with any type of canned tomato product. Feel free to use whole tomatoes and break them up a bit as you cook, or go with crushed tomatoes for a smoother soup.